Minimalist running shoes have gained a lot of attention in recent years, but how exactly do they differ from more traditional shoes, and what does the evidence say about them? Minimalist shoes are clearly much lighter then traditional running shoes; the vibrum five finger barefoot runner weighs in at 6oz, the minimalist Nike free 7oz, and Nike Pegasus (one of the lightest neutral standard shoes) weighs in at 12oz. The other defining feature the this group of shoes is a low ramp angle, or height discrepancy between the heel and toe. Whereas traditional shoes typically have a heel lift of 10-12mm, minimalist shoes range 4-8mm, and barefoot runners can be as low as 0mm. Recent studies have begun to focus on comparative injury rates of different shoe types, and Vancouver is the site of much of this research. This spring, UBC’s Dr.Jack Taunton evaluated injury rates in habitual runners training for a 10km race using either a barefoot runner, minimalist shoe, or a light weight neutral shoe. 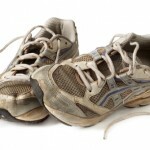 All runners were injury free over the previous 12 months, and none had a history of use of minimalist shoes. It is worth noting that those with significant pronation were not included in the study. 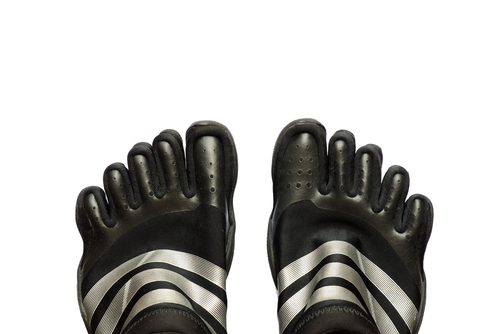 The lowest injury rate of 13% occurred in the lightweight traditional shoe, followed by 20% with the Vibrum five finger barefoot runner, and 38% with the minimalist Nike Free. As the study duration was only twelve weeks, these rates may level out as runners further accommodate to a new shoe type. Also worth noting is that many runners in the minimalist groups ran a personal best! Another recent study, published by Ridge et.al., evaluated 36 experienced runners training over a ten week period in either a traditional running shoe or a barefoot runner. Despite a cautious transition into the barefoot running shoe, over half of those in the barefoot shoe showed a significant increase in bone marrow edema (swelling) in at least one bone in the foot complex, with 2/19 exhibiting stress fractures. individual, can result in greater muscular control, a more efficient stride, and for many, improved finish times. Individuals with significant pronation, tight calves, or a history of Achilles injury may not be appropriate candidates for their use, and will need to take a longer time to transition into these shoes. Runners should begin a transition training program prior to making a switch in order to reduce injury risk. To safely transition to these shoes, focus your workouts on balance work, calf lengthening, ankle stability work (use of the Bosu ball or wobble board, patterned jumps), lifting of the big toe, and core stability. Be aware of the risk to the bony tissue of your foot complex, and be very cautious in the presence of any foot sensitivity. Plan to take about three months to fully transition to using for significant amounts of your running time.. Need help with your running? Contact marnie@w4pt.com or book an appointment with her at West 4th Physiotherapy. This entry was posted in Avoiding Injury, Running and the SunRun, Sports and tagged minimalist shoes, Nike Free, Running and the SunRun, running shoes. Bookmark the permalink.